WASHINGTON — Senior executives at Volkswagen AG including former CEO Martin Winterkorn covered up evidence that the German automaker had cheated on U.S. diesel emissions tests for years, three U.S. states charged on Tuesday in civil lawsuits against the company. New York, Massachusetts and Maryland filed separate, nearly identical lawsuits in state courts, accusing the world’s No. 2 automaker of violating their environmental laws. The lawsuits, which could lead to state fines of hundreds of millions of dollars or more, complicate VW’s efforts to move past the diesel scandal that has hurt its business and reputation, and already cost it billions of dollars. The suits outlined more than a decade of efforts by VW to deceive regulators in the U.S. and Europe, citing internal VW documents. VW last September admitted using sophisticated secret software in its cars to cheat exhaust emissions tests, with millions of vehicles worldwide affected. The scandal prompted the departure of VW’s CEO and other executives. The suits were filed by New York Attorney General Eric Schneiderman in Albany, Massachusetts Attorney General Maura Healey in Boston and Maryland Attorney General Brian Frosh in Baltimore. 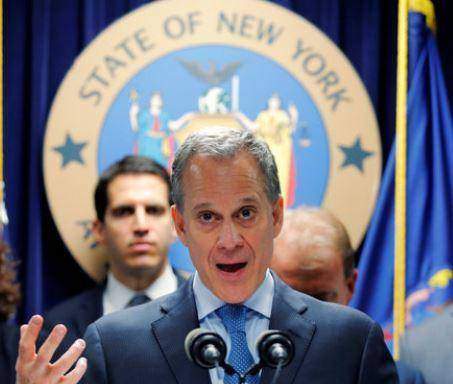 Additional states could file similar actions, Schneiderman’s office said. Volkswagen spokeswoman Jeannine Ginivan criticized the states’ decision to file suit and said the company already has agreed to spend billions of dollars to address all environmental harms from the excess emissions. Winterkorn and VW’s former global head of marketing, Christian Klingler, knew by spring 2014 “of the existence of unlawful ‘defeat devices’ and did nothing to prevent both Audi and Volkswagen from repeatedly deceiving regulators,” the New York lawsuit stated. In March 2014, VW learned that West Virginia University had conducted testing that found real-world testing on two VW diesel cars had emissions five to 35 times legally allowable limits, the suits alleged. German prosecutors said last month that Winterkorn is under investigation. The New York suit stated that current CEO Matthias Mueller, then head of project management at Audi, and Winterkorn became aware in July 2006 of the effect of undersized urea tanks on the ability to comply with emissions standards. The suit said VW opted to install defeat software instead of larger tanks to save money. The suits did not state Mueller was aware of the cheating. The suits alleged that VW initially used the defeat devices in 2.0-liter vehicles because the soot filter would break within 50,000 miles if used at all times, far sooner than required under U.S. law. The suits cited internal documents from as early as 2007 about Volkswagen’s determination to promote “clean diesel” technology as a rival to Toyota Motor Corp.’s Prius hybrid. The states obtained 1.1 million documents totaling 7.5 million pages in their nine-month VW investigation. VW has admitted that it installed improper software that deactivated pollution controls on more than 11 million diesel vehicles sold worldwide, and last month agreed to pay $15.3 billion to settle U.S. federal litigation and charges lodged by 44 U.S. states that the company violated consumer fraud laws. The U.S. Justice Department and EPA have not yet reached a deal with Volkswagen on fines as part of separate settlement that could lead to an outside monitor overseeing VW’s compliance with U.S. laws. VW also faces a Justice Department criminal investigation. VW faces potentially billions of dollars more in costs in the U.S. if it is forced to buy back 85,000 3.0-liter Audi, Porsche and VW cars and SUVs sold since 2009. Last week, California rejected its proposed fix plan.